Condition: almost new piece is in excellent condition, no flaws. Dimensions: height 14 cm, length 15 cm x 8 cm. A hand-blown crystal statuette, representing a dolphin leaping from the waves. 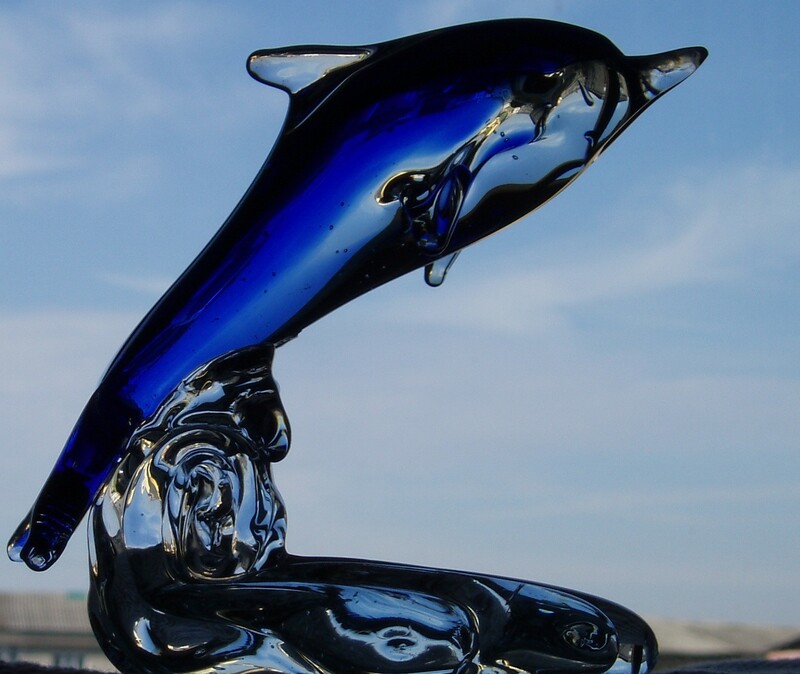 At least that was the glazier artist's intention - as long as modeled wave-shaped base - which breaks the blue dolphin jumping. 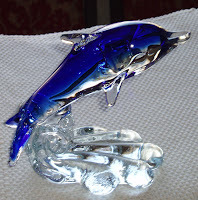 The object is achieved sommerso technique (invented even the Murano in 1930 by Carlo Scarpa), two layers of glass, ie the colored (something between Lapis Lazuli and Royal Cobalt blue) and clear - that is covering - and is modeled in the form. Such a crystal object art modeling involves a highly technical, requiring at least two artists to do. If we were to refer to the shape / silhouette piece, my beautiful epithet would seem poor, given the beautiful color and perfect proportions, I would say. I do not know if the images are sufficiently indicative that whatever you photograph, you can not represent the crystal magnificence and splendor. You need to have the piece at hand to achieve what you have to do! It should also be mentioned, and not least, this subject of art, offered for sale, is large (say not very large) for its category, if we consider its overall quotas - to what is found generally in figurines /statuettes crystal.